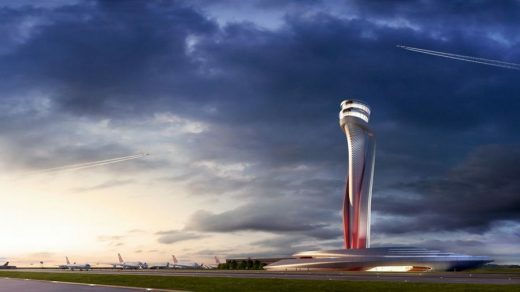 Istanbul New Airport has been shortlisted for the “Best Futura Mega Project Award” by the jury of MIPIM, the world’s most prominent real estate exhibition. This year, 230 projects from 42 countries applied for the MIPIM Awards to be presented during the 27th edition of MIPIM Exhibition. Selected by the jury after careful consideration and released on 26 January 2016, the shortlist includes 44 projects in eleven categories in total, four projects from each category. Among the shortlisted “Best Futura Mega Project” is Istanbul New Airport, currently being constructed by İGA Airports, which will also operate the airport for 25 years. 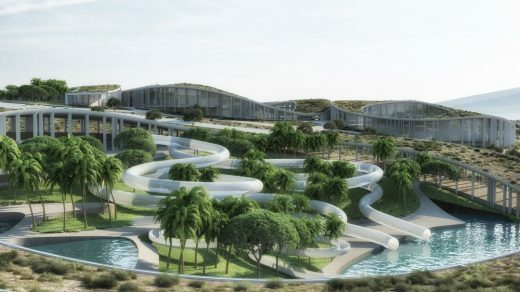 While the conceptual design of the airport is by Grimshaw Architects and Nordic Office of Architecture, the detailed architectural design is by Scott Brownrigg. The winners of each category of the internationally reputable real estate competition will be determined in the final round of voting by the visitors of MIPIM Exhibition, taking place in Cannes, France from 15 to 18 March 2016. The exhibition is expected to attract more than 20,000 sector professionals and to be attended by over 2,500 companies. In addition, all the projects nominated for MIPIM Awards will run for the ‘People’s Choice Award’ thanks to a pre-MIPIM online vote. Independent of the categories, the ‘People’s Choice Award’ is applicable to all 44 projects nominated for the MIPIM Awards. Anyone who would like to support the biggest project in the history of the Turkish Republic can vote for Istanbul New Airport from 12 February to 14 March 2016 on http://mipim-peoples-choice-award.com/ . The winner of this award will be announced on 17 March 2016 during MIPIM Exhibition. 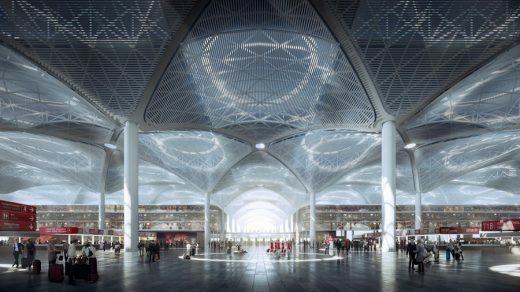 An international architectural team of Grimshaw, Nordic Office of Architecture and Haptic Architects have today released images of the terminal complex for the new Istanbul Airport. 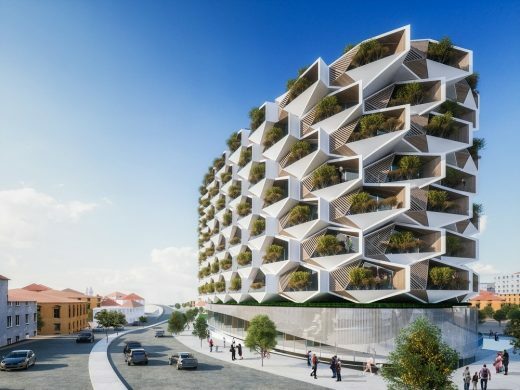 Appointed by the Turkish consortium of Cengiz, Kolin, Limak, MAPA and Kalyon, the plans have been created following an intensive design period. Based on the Black Sea coast, some 35km outside of Istanbul, the ambitious six-runway development, master planned by Arup, will be delivered in four phases. 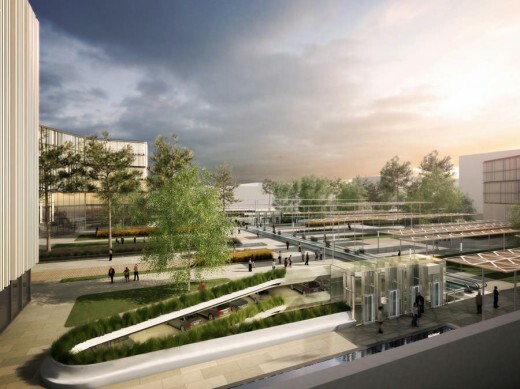 The first phase will open in 2018 and aims to serve 90 million passengers per year. This will increase to over 150 million passengers per annum once fully complete. 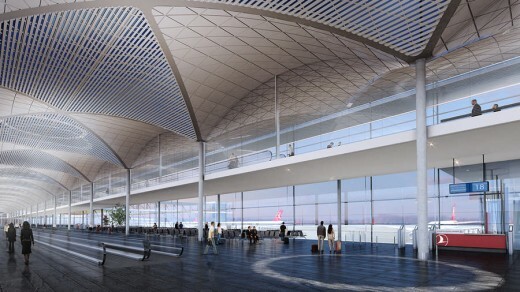 Terminal 1 of the Istanbul New Airport will be the world’s largest airport terminal under one roof, with a gross floor area close to one million square metres. 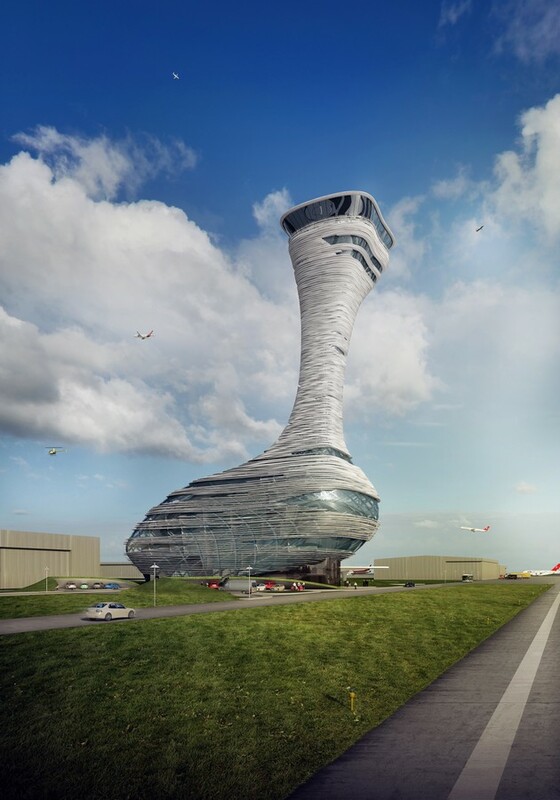 The Istanbul Grand Airport will be a modern and highly functional, with a unique sense of place. 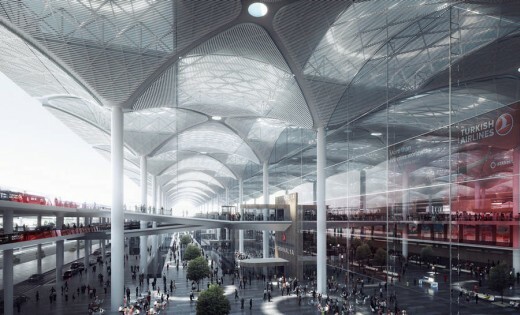 The architectural design of the terminal is closely linked to the area’s unique character and will act as a stunning gateway to Istanbul and Turkey. In spite of its size, the terminal building is conceived as one that sits calmly in its context, with a clear horizontal expression. With a generous plaza and an efficient traffic forecourt on the landside, rail, metro, bus, coach and parking seamlessly integrates with the terminal and the proposed Airport Park Central. Internally, the vaulted ceiling geometry gives a strong sense of directionality, from landside to airside, but also for responds to people traversing the terminal along its length. The roof and layout design will reinforce passenger flows, whilst enhancing passenger experience with intuitive wayfinding. Skylights provide natural daylight, which is diffused through the ceiling via focused beams of direct sunlight. This daylight highlights key areas in the terminal such as check-in, security, passport control and the retail environment. Principal Partner of Nordic, Gudmund Stokke said, “We are glad to be able to respond to the high demands of the client and create an exceptional solution, both in terms of functionality and architecture”. Grimshaw was founded by Sir Nicholas Grimshaw in 1980. The practice became a Partnership in 2007 and operates worldwide with offices in New York, London, Melbourne, Sydney and Doha employing over 300 staff. Grimshaw’s international portfolio covers all major sectors, and has been honoured with over 150 international design awards including the prestigious Lubetkin Prize. Grimshaw’s international reputation as transport architects and leaders in the planning and design of air and rail projects dates from the early 1990s, beginning with the new concepts for air travel we exhibited at the Venice Biennale in 1991. Since then, the practice has developed a number of key international aviation projects including Zurich Airport, Terminal 2, Concourse B at London Heathrow and the new terminal for Pulkovo Airport in St Petersburg. Nordic Office of Architecture is the largest architectural practice in Norway, employing around 130 professionals. Nordic is supported in London by Haptic Architects. Haptic collaborates with Nordic on a number of airport projects around the world and acts as a link between Nordic and Grimshaw. Haptic were founded in 2009 and have offices in London and Oslo. They are working in a number of sectors from infrastructure, hospitality, residential, commercial, health, retail and masterplanning.